P&M Tone-Stack delivers the guitar amp tone you’ve been yearning for ever since you sold your amp on craigslist. 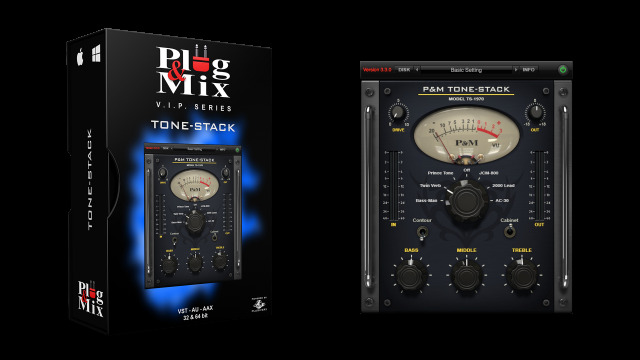 Tone-Stack includes 6 classic amp tones as well as a cabinet switch and tone modeling controls for precise control over your screaming guitars, bass, synths, vocals and beyond. Use the drive knob for extra grit and boost your lead lines into the stratosphere. - DRIVE - Controls the drive amount of the amp section. - AMP TYPE - Select from 6 different classic amp types. - CONTOUR - Switches on extra tone-shaping for added control. - CABINET - Switches on the cabinet emulator for authentic guitar amp mayhem. - BASS - Dials in the low end of the effect. - MIDDLE - Adjusts the mid-range of your tone. - TREBLE - Adds bite to your signal.